Pulling on the leash is actually a very common problem with dogs in general, not just for Mastiffs. A dog might pull for several reasons. Most often it is only because they are very excited. Allowing the dog to settle down before walking can often stop the leash pulling. Sometimes, because of the dog pack mentality, a dog assumes leadership over its owner as if he were the leader of the pack. Therefore, the dog must be trained as to who the master is. The owner must establish him or herself as the leader of the pack. Failure to do so will result in ineffective training of any kind. The first step is to train your English Bull Mastiff to sit still while you put the leash around his neck. Mastiffs love to spend time with their owners and they become very excited. Training your dog to be calm while preparing to go for a walk is an important step to leash training. You can put toys or treats in your pocket to encourage your Mastiff to remain near your side as you walk. If he loses his concentration because a cat or another dog is nearby, you can change direction and coax him with a treat to get his attention back. The idea is to get your puppy to be aware of you and your body so he will walk beside you and not wander or pull on the leash. If he begins to wander off or pull, stop walking. The collar will tighten and he will have to stop and turn and look at you. He will probably be confused at first as to why you are stopping. Coax him back to you and try walking together again. At times you may need to give a gentle tug on the leash to get your puppy's attention and to remind him that you are in charge. Never jerk harshly on the leash as this can cause damage to your dog's trachea. You only want to get his attention, not frighten or harm your puppy. Be consistent and persistent when leash training your English Bull Mastiff dog. Always, always praise him for his obedience. Mastiffs love nothing more than to please their owners, so praise goes a long way. Be patient, firm, and kind as you will get the desired results. Leash training is so important, especially with large dogs. Failure to do so can lead to all sorts of problems, especially if they get off the leash around young children or other dogs. A well trained English Bull Mastiff is a joy to own and to be around. Sam Daniels is a dog trainer and enthusiast and, for a limited time, is offering his extensive Mastiff Care Secrets course free of charge. 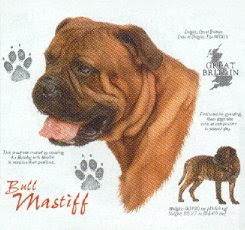 It is jam-packed full of must-have information for Mastiff owners! Learn more about Mastiff Care Now!